I'll preface the point of this post with an embarrassing secret: since moving into our new place in the East Village in August, we have yet to set up Internet or cable. Yep. No TV. No Netflix. No Hulu or HBO Go. To cope, my roommate and I have become quite cultured. We now come home from work, chat, make dinner, and settle in with actual books and magazines. Add a couple of long plane trips to this dark ages situation and I've managed to crush a couple of really excellent books, so I thought I'd pass my recommendations on to you. You guys, and probably mostly ladies, I really, really loved both of these books. Like more than I've loved any book in a long time. They both weave coming-of-age stories of kids in their early 20s, dealing with careers, romance and a fair amount of substance abuse and mental instability. I am not a literary critic, so I won't attempt to summarize the deeper meaning of these books, the symbolism, the nuances... This is just a little PSA from your friend the fashion blogger. I'll will say this: I am a die-hard lover of fiction, and any book that can carry me away to a different time and place and somehow make me feel more than events occurring in my own life - well, I'm sold. These two novels both managed to do just that. 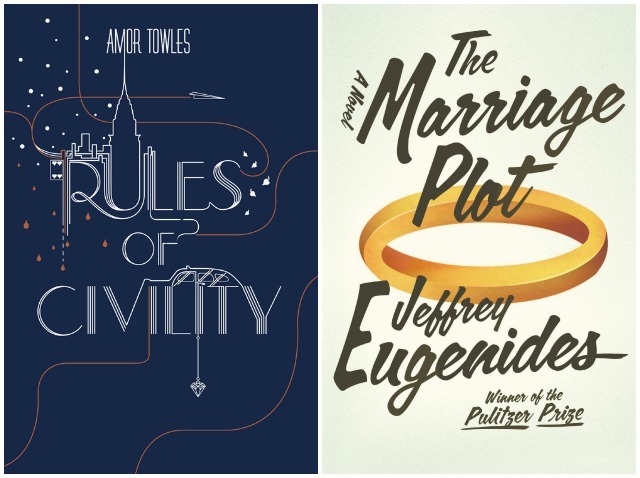 Rules of Civility & The Marriage Plot. If you're in need of a mental getaway, or the perfect novel for curling up by an October fire with your mug of cider and flannel blanket - either or both of these will do the trick. Have you read any great novels lately? I'm just now finishing up The Virgin Suicides (dark, I know) and I'm ready for something new! My book club is reading 'The Rules of Civility' this month. I plan to have pleeeenty of champers on hand for our monthly gathering. Really loved the story, appropriate for any time period but especially glamorous in the '30s! my book club is reading Beautiful Ruins... really, really good.